BLACK DIGGERS by Tom Wright presented by Sydney Festival in association with The Balnaves Foundation. A Queensland Theatre Company and Sydney Festival Production, in the Drama Theatre, at the Sydney Opera House. BLACK DIGGERS, by Tom Wright, was a World Premiere given as part of the 2014 Sydney Festival. Lieven Bertels, the Sydney Festival Director, in his message in the program notes ($12 for a program) tells us that the festival has over the last two festivals – premiered 23 new Australian works from small scale children's shows and music recitals to fully fledged theatre productions that continue to tour nationally and internationally. He goes on to say: "Of all these, BLACK DIGGERS is perhaps the one I feel strongest personal connection with. It all started at a dinner with Wesley Enoch in the winter of 2011." The military speak of a war zone as the 'Theatre of War'. In the arts we have the privilege and the duty to make 'Theatre of Reflection', not just to address the darker pages of our past, such as the colonial-indigenous relations in this nation's history, (maybe, an allusion to last year's triumphant Festival event, THE SECRET RIVER) but also to bring out universal human virtues and to find paths of reconciliation. The latter has become a central goal for Sydney Festival, and the launch of our Reconciliation Plan in July 2013 was an important cornerstone for us. The journey of our BLACK DIGGERS project allowed us to go beyond a mere plan and put some words into action, building cultural awareness and understanding of the diversity of Aboriginal and Torres Strait Islander stories. I feel privileged to have been part of that journey. One purpose of Indigenous theatre is to write on to the public record neglected or forgotten stories. ... One hundred years ago Indigenous servicemen volunteered to fight for the newly formed country called Australia.Though the constitution of this newest of old countries did not recognise them as citizens, Indigenous men signed up and fought in Palestine, the Somme, Gallipoli, Flanders Fields and every major battlefront during what would be called the Great War. ... Over 1000 Indigenous men fought side by side with their white countrymen and forged bonds that would sow the seeds of the modern reconciliation movement. Personal Truth - The thing you believe to be true. Social Truth - what a group believe to be true through discussion and debate. Forensic Truth - the truth that can be proven through science and records. Public Truth - the value of telling the truth for the greater good. BLACK DIGGERS reflects on experience of Indigenous people before nationhood; the Enlistment experiences; the Theatre of War; the Return, looking at the expectations and actual treatment of the Indigenous veterans; and the Legacy. Mr Enoch: "BLACK DIGGERS honours the memories of these men and their families ..."
The WHAT and the WHY of the origins of this project , as stated by the two commissioning partners, Mr Bertels (Sydney Festival) and Mr Enoch (Queensland Theatre Company), are undeniably important. And, certainly, it does bring an honourable consciousness of this history of the role of the Indigenous soldiers to this era, and reveals, once again, the embedded racism and seemingly inhuman disregard that the dominant white culture in its Governmental attitudes and practice had towards the original peoples of this country (check out Big hART's 2010, NAMATJIRA). What Mr Bertels talks of as "the privilege and duty" in presenting this project for the Sydney Festival as part of "The Theatre of Reflection" - strikes the right chords of the aspirational and political. What disturbed me while watching this potentially important theatre, then, was not the WHAT and WHY of the project, but, HOW it was done. There could not have been a more incompetent work, that, as it was revealed on the stage, became a transparent missed opportunity for real 'agit-prop' (agitation-propaganda) theatre - BLACK DIGGERS being, in the experience, decidedly, more in the vein of propaganda than agitation - that dwindled in impact, with the unfolding experience of watching, into a less than ordinary, less than captivating T.I.E. (Theatre-in-Education) endurance test. Seeded two and half years ago, over a winter dinner, in July 2011 - a very long time, for these 'seeds' to grow in theatrical terms (before the ill conceived and presented 2012 Sydney Festival event, I AM EORA, also directed by Wesley Enoch). This work has benefited from the research of Dr David Williams (the former Artistic Director of Version 1.0 - the verbatim theatre company) and the writing experience of Tom Wright (an integral member of the Artistic team at the STC up until 2012). Both these men are of some lauded academic and theatrical experience. Yet what do we have on stage? Some "60 scenes broken into five parts"! 60 scenes! These 60 scenes are, mostly, clumsily organised 'clumps' of research, that in production are almost lumpen in kinetic affect. There is little theatrical dramaturgy (Dramaturg: Louise Gough) going on here in the performance text to facilitate a sufficiently interesting, engaging through-line of narrative, or character, to allow a sustained concentrated and immersive audience involvement and identification at any real kind of profundity, that the theatre can, usually, give. The material for BLACK DIGGERS has been disappointedly organised to produce a gradual clobbering - with isolated monologues, to-the-front partnered interacted scenes, that may. or may not, have arresting textual interests, revelations, a few songs and back slapping heartiness, entrances and exits of the omnes of men in costume/uniform, accompanied by a Sound Design that attempts to give some circumstances of theatrical 'geography' for the audience to find their bearings - to a state of emotional inertia, if not complete disinterest. I find it telling that Mr Enoch begins his program notes with: "One purpose of Indigenous theatre is to WRITE on to the public record neglected or forgotten stories", for, it seems to me, that that is all he has achieved with this project, is the WRITING of a public record, for this text has not really begun to solve the manner to present, to an audience in 2014, on a stage, the important ways to bring to our attention, in a cogent and thrilling theatrical form an unforgettable experience. UNFORGETTABLE. Unforgettable as, entertainment, education or a place of ecstasy, it , definitely is not. It is, in truth, mostly, a dull recitation of researched information - verbatim findings. Let us next recall, possible 'role' models, that similar productions utilising the dramaturgical form of BLACK DIGGERS, that Mr Wright and Enoch have 'wrestled' with, for us: the classic Joan Littlewood, OH, WHAT A LOVELY WAR! 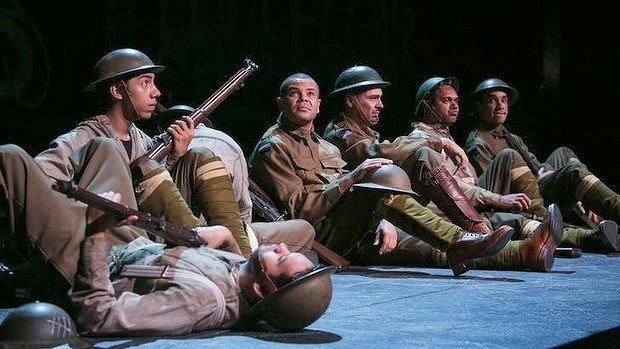 or, an even more recent work, the Sydney Theatre Company's GALLIPOLI directed by Nigel Jamieson (that despite its verbatim origins being so tediously used, was, at the very least, a demonstration of storytelling "How" that could be engaged to present the material, more interestingly than any technique used by BLACK DIGGERS - Mr Wright was part of the STC artistic team at the time of its presentation, 2008, and must have vivid memories of the work - its theatrical difficulties, its strengths and weaknesses). Even the Big hART production of NAMATJIRA, and its use by Scott Rankin, in creating a theatrically viable manner, to shape the 'verbatim' material of the evidence, research, of the subject at the heart of the project, the life of the painter Namatjira, is another 'role' model of technique - and, indeed, perhaps the use of the black-board illustrations employed by that production was the derivative inspiration for Stephen Curtis' Design, here, perhaps? If the original material gathered by Dr David Williams was developed even further, the models of the traditional war play abound: R.C. Sheriff's 1928 play, JOURNEY'S END; Somerset Maugham's 1932, FOR SERVICES RENDERED; the Australian 1979 play, THE MANUAL OF TRENCH WARFARE by Clem Gorman, even the recent adaptation of Michael Morpurgo's novel WAR HORSE, in 2007, by Nick Stafford, a combination of Brechtian and 'melodrama' techniques - all plays dealing with the World War 1 experience - are infinitely more affecting then the relatively, lazy construction of the material that is BLACK DIGGERS. How did we end up with this melange of dreary theatrical dramaturgy/literature? How much focused time was given by these artists, Mr Wright and Enoch, and the Sydney Festival, Mr Bertels, in mentoring this product, getting the playwriting form right? Mr Bertels, after all, feels 'a privilege and duty' to have been part of that journey. Just how much of that journey was the Sydney Festival, other than the co-commissioning and funding' of it, actually involved with? How much duty of care to the aspirations of the Reconciliation Plan of July 2013, of which Mr Bertels says BLACK DIGGERS came to be '"a cornerstone" for the Sydney Festival, was given? Particularly after the I AM EORA production/experience, which was less than successful as an enduring theatrical exercise. There has to be more than talking the talk. There has to be a true walking the walk, surely? The Balnaves Foundation is constantly, actively, supporting these projects, on trust, for good outcomes - if not, occasionally, for a great outcome. If I AM EORA and BLACK DIGGERS are examples of the "cornerstone"(s) of the Reconciliation Action Plan (2013) instituted by the Sydney Festival, then the building for the future has not a very stable or secure quality of material to rest on. It was, indeed, exciting to see nine Indigenous performers on the stage. The challenge of the raw material, considering the altruistic' 'mission' of the intention of the project - to tell for the first time the 'neglected or forgotten stories" of their forebears - the multitudinous tasks that each was given, was also exciting to apprehend. However the range of experience of the acting company was/is really extremely disparate. The range of their skills, too, extremely, disparate. To assist this selected group of artists to acquit their tasks well, considerable skill by the Director would be needed to be employed. Mr Enoch seems, at best, able to organise the actors on and off the stage and muster them into groupings - moving of bodies, choreography. What he does not seem to be able to do, with his credited Acting Coach, Jason Klarwein, is to use the text, language to direct, guide, assist the actors into creating characters, or even a convincing ownership of the text, beyond a generalised emotional veneer of recited words, that give the audience, only a kind of gist of what is being said and/or the meaning of it, both literal and theatrical. Most of his actors were flailing with no real clarity for the required needs of the material. Most of them recited and pretended their way through the work - sometimes unbearable to watch, let alone believe or engage in. Guy Simon was the best survivor of the lack of guidance from Mr Enoch and Mr Klarwein. Playing an immense number of responsibilities, it was he that could clearly delineate one offer from the other and also offer a sense of the architecture of his textual responsibilities, resulting in a carefully communicated arc of emotional journey as well as information. The forbidding textual explanation of the causal incidents of World War 1, written by Mr Wright, received a justifiable round of applause - the clarity and sense of the particulars were minutely accurate and communicated to us along with a wry sense of irony by Mr Simon. He seemed to exit as "Mother' in apron, only to immediately return in uniform as "Officer"etc, convincingly. He was a constant standout in every task he had and his sheer, understated stamina of invention should be more highly recognised. Hunter Page-Lochard, young and relatively inexperienced, too, made an impression as did the tentative presence of Eliah Watego. Th next best performance was given by the bugler CPL Ian Stenning with his focused, specific and emotional rendering of the Last Post - without a scintilla of irony. More experienced actors, Luke Carroll and David Page, even the very exciting and promising talent, Meyne Wyatt, seemed to be simply lost, or just plainly defeated, presenting recitations in generalised emotional states with amateur character-acting characteristics-choices: for instance, an old-man voice for an old man, quavering a superficial sound and gesture as a hopeful aid for clarity, that distracted one away from any sense of the speech or its dramatic impact - clearly in need of hands-on direction. 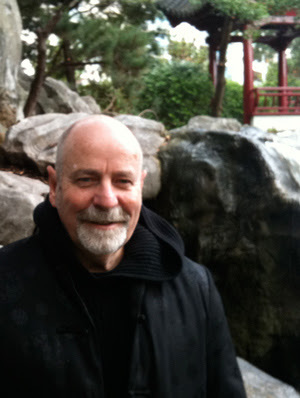 Set Design was by Stephen Curtis. Costume Design by Ruby Langton-Batty. Lighting Design by Ben Hughes. The Sound Design by Tony Brumpton was the most convincing of these offers elicited by Mr Enoch. The sheer joy of having this story told, this stark history brought to our attention, by this company, was a worthy event to have witnessed. The audience I saw it with was generous in its applause. I, however could not get beyond the writing and the direction to appreciate the explication - and after a hand clap, or two, to signify the ideals of the project, I left the theatre, quickly, into the foyer. Here, in the foyer, a small exhibition with historical photographs of some of the soldiers, with paragraphs of written information about their origin and war record, gave me more emotional satisfaction, more objective intellectual appreciation of what and why and who these men were then anything that I had witnessed, in an almost two hour theatrical performance. Why and how did that happen? I have now seen non-actors, performers, tell the story of Australian soldiers in Afghanistan in THE LONG WAY HOME, created by the Sydney Theatre Company, and the Australian Defence Force, built from verbatim research and sculpted into a dramatic text by Daniel Keene, expertly directed in all areas, by Stephen Rayne, and had an unforgettable experience in the theatre: Education, Entertainment and Ecstasy, prepared in much less time than BLACK DIGGERS. I have read some generous response to this Festival work. I have hesitated in my response, but felt compelled to diarise my experience as to the quality of the work, and maybe, just maybe, give some pause to the creators of BLACK DIGGERS, and have them really examine/overhaul the scheduled September presentation in Brisbane so that ideals and professional practice can be more wonderfully 'married'. Other than the emotional catharsis of the opportunity that the work can give a concerned audience, this work is extremely disappointing considering the proffered and rewarded experience of the artists at its helm. I was, during the performance, aggravated to a distress of considerable degree, for the loss of a quality result with this vitally important story. For me, the objective aims of Mr Bertels: "the building of cultural awareness and understanding of the diversity of Aboriginal and Torres Strait Islander stories" was grossly fudged with this work. If this was theatre for the forgotten, the wronged, the wounded, the reality of BLACK DIGGERS was a blur of inept communication. Daniel Keene and Stephen Rayne, the Sydney Theatre Company and the Australian Defence Forces, got it right in much less time than Tom Wright, Wesley Enoch, Lieven Bertels, the Queensland Theatre Company and the Sydney Festival. The question I am asking is, HOW did I one group succeed and the other not?